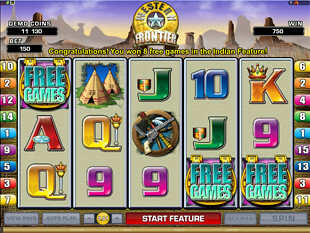 Who doesn’t know the history, risk to repeat its mistakes… So, let’s back in time to find out more about Indians and Cowboys playing Western Frontier Slots Machine. See everything with your own eyes and make a good hand of it! Mustang is one of the most freedom-loving and fast creatures of the slot. This willful horse is also a wild symbol that can replace any other inhabitant of the slot. Yep. What is more, Mustang becomes a wild multiplier during Indian Feature. So that, if you manage to catch this beautiful animal in your winning combo within bonus round your win will be given a wild boost by 2 times… Yeee ha! Everybody knows that Horseshoe is the powerful talisman of luck plus it’s a scatter symbol of the game. So, we recommend you to take the symbol with you, because it’ll definitely help you to win Free Spins as well as increase your total bet by times. Yeah! 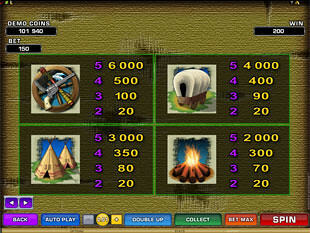 Fun and gain in the western style by placing a real money stake! Moreover, you are free as a wind to choose the coin size ranging from $0.01 and up to $0.50. Also you can set up to 10 coins per line to increase your total bet and in the way to boost probable winnings. Just venture to fix the highest stake of $75 per spin and you will get the chance to conquer the most vicious jackpot of 6,000 coins or $3,000! Just manage to catch 5 symbols of Revolver&Tomahawk on the payline to seize the ultimate prize! Anyway, it’s only up to you to choose. Watch out for 3+ scattered Horseshoes on the reels to start the most gainful battle for BIG money wins! 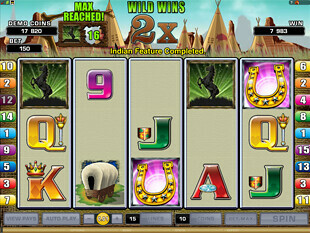 Just because in such a case you will activate Indian Feature and grab your 8 Free Spins with Mustang as a 2x wild Multiplier. Your aim is to catch and tame as much more willful wilds as you can only. Just because the next bonus round depends on it… Oh, by the way, 3 or more scatters collected during the feature award you with 8 extra Free Games! As you see there is a weighty reason to battle for. 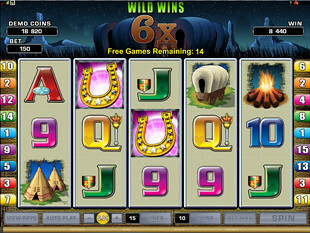 Beyond, if you’re a true lucky devil to hit 3+ scatters during Cowboy Feature you will also get 8 more Free Games! Adrenaline through your veins, fast heart-beating and killing prizes in your hands… Do you feel craving for hazard? Then try your sixth sense with Double Up Feature. Just gather any winning combo and activate the bonus. Here you’ll be faced the choice… Guess the card color and your prize will be doubled. But if you venture to predict the card suit then your win will be boosted by 4 times. Play the game if you have enough courage for that. 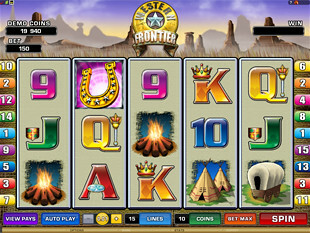 Get a true adventure in the western style with the online Microgaming slot right now! 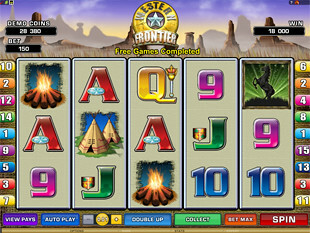 Just launch Western Frontier slot to journey back in time and appear in reel Wild West!